khub bhalo event. bengali aar mishti…..go hand in hand. i am not a bengali just born and bought up in calcutta. its so nostalgic to talkin bangla. count me in. Hey Sudeshna I must sound nuts right now…but tumi ki aamake bolte paarbe ektu …aami ki kore tomar post n logo ta link korbo aamar poste?? i have merely copy pasted your link on my blog post entry. Is tht all?? Ektu shahjyo kkoro plz. By the way, your event is great! And I have already sent my entry. My first entry eversince I entered the blogging world. :-)Mone keto anondo!! Have sent you my entry! hi…my entry is on the way..
great theme during festive time… will surely send in few things!!! Thank you Sudeshna for visitng the FIC round up, and your comments. 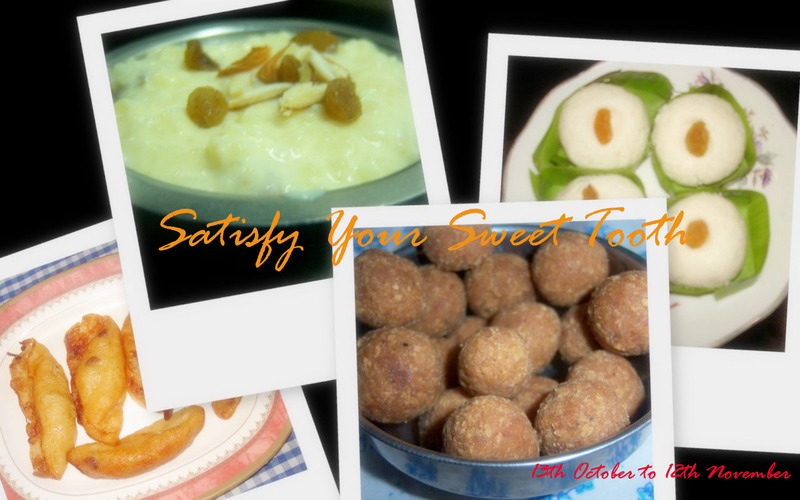 I will surely send in the links and if possible blog some of the Navratri delicacies and send them to your sweet event too! I sure have a sweet tooth..Count me in..And waiting for the roundup..